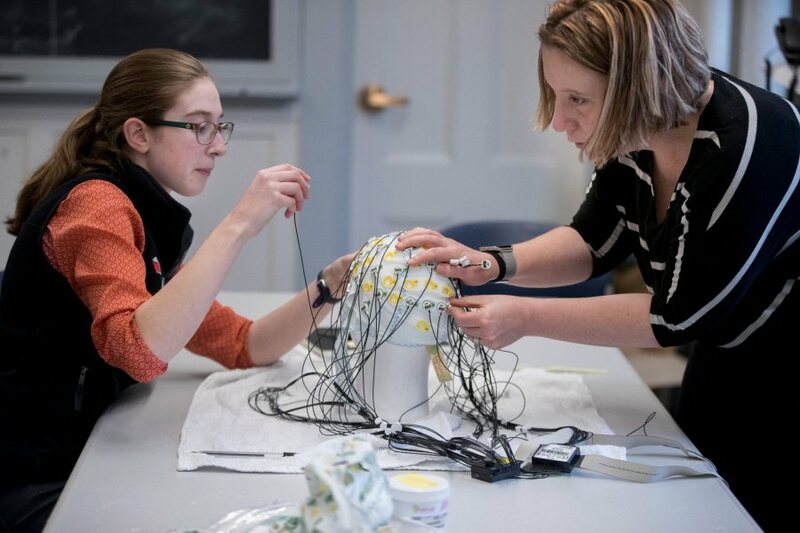 Bates students in certain majors, like psychology and neuroscience, conduct studies on topics ranging from behavior patterns to how the brain perceives images. Often, they recruit fellow Bates students as participants. In early March, I was one of those students. For her senior thesis in neuroscience, Hanna De Bruyn ’18 worked with Assistant Professor of Neuroscience Michelle Greene to set up a study that examined visual perception. Specifically, De Bruyn looked at “backward masking”: the phenomenon whereby a visual stimulus, known as the target, is followed by another stimulus, the mask. The second stimulus prevents the brain from perceiving the target image to a certain extent, meaning it doesn’t form as good a memory. Using an electroencephalogram (EEG) machine and machine learning techniques, they measured how much information about the original picture persists in our brain when the mask is on the screen. I was one of 15 participants in the study, which was approved by Bates’ Institutional Review Board. 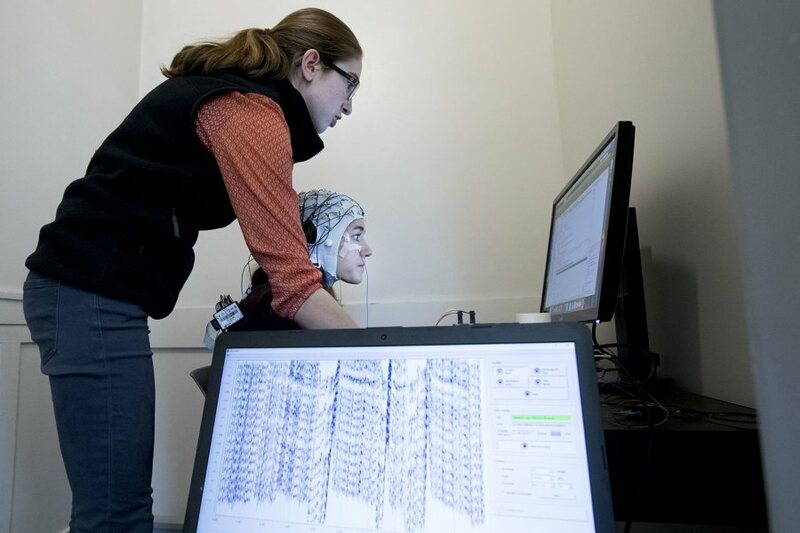 EEG machines, which measure electrical activity in the brain, are often used to detect epilepsy and other disorders, or in neuroscience studies like De Bruyn’s. 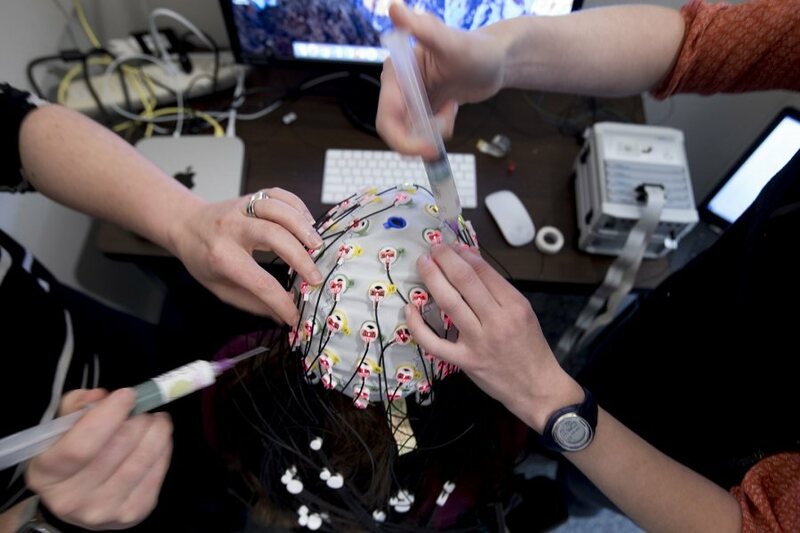 This is the first year that EEG tests have taken place on campus for senior thesis projects. Greene, who arrived on campus last fall, uses her expertise in visual perception and EEG technology to work with students interested in the neurological complexities of vision. “[EEG] is one of these lovely techniques because you can learn it easily as an undergraduate, and you are able to analyze and see millisecond-by-millisecond brain activity, which is really exciting,” Greene told me. The timing was perfect for De Bruyn, who spent two summers researching epilepsy and had seen doctors give EEG tests at the Child Study Center at Yale University’s School of Medicine. EEGs, she realized, lay at the intersection of her interests in health, coding, and education. I had never done an EEG test before, and I learned that there’s quite a lot to the process. I met De Bruyn and Greene in Hathorn Hall. After testing my vision, they sterilized my forehead with alcohol wipes, then placed what resembled a swim cap on my head. Then they connected 64 electrodes to my scalp; each electrode was connected to the EEG machine. De Bruyn informed me that photographs of scenes such as a bedroom or a skyscraper would flash before me, regulated by a code that De Bruyn wrote. If the same image appeared twice in a row, I was instructed to press the space bar. This seemed easy enough, but once the study began, the photographs moved very quickly, and were followed by either more blurry images — the masks — or by a blank screen, a control. It was difficult to keep track of the order of the images, let alone remember not to blink or move! The study usually runs for two hours and comprises 45 blocks of images. But for all the preparation and instruction, I only lasted an hour. My brain waves were too hard to read. De Bruyn assured me that such complications are common and inevitable. After examining the data from the other participants, De Bruyn and Greene found that they were able to perceive the same amount of information from the target image whether it was followed by a mask or a control. That’s different from what other studies have found, Greene says. “It’s interesting because it shows the extent to which the brain is still processing the picture even though it is no longer physically present,” she explains. These twists and turns are what De Bruyn enjoys about her major.